Tom Blumer, the economic genius behind BizzyBlog and a new contributor to the Cleveland Plain Dealer’s brand-spanking new Wide Open blog (along with Dave from NixGuy) made me aware of an article in Tuesday’s Plain Dealer by David Briggs, “Islamic Center hires new imam to replace deported cleric”, announcing that the Islamic Center of Cleveland, former home of Palestinian Islamic Jihad leader Fawaz Damra (before the US government stripped him of his citizenship and deported him back to Israel earlier this year), has been replaced by Ahmed Alzaree, who will assume his new position as head cleric on November 1. The Associated Press has also picked up the story. Alzaree comes to the Buckeye State from Omaha, Nebraska. Considering Damra’s high-profile expulsion from the US, you would think that the Islamic Center of Cleveland would hire a more moderate voice to lead them than the terrorist cheerleader they had most recently. Think again. Dear brothers and sisters, the talk about the Day of Judgment is long and full of things that will confuse the human mind and put fear in the hearts of the faithful. Every day that comes is much more Worse than the day before it as we get closer to the hour. Among the signs of the approach of Day of Judgment is what the messenger of Allah PBUH said: “The hour of judgment shall not happen until the Muslims fight the Jews. The Muslims shall kill the Jews to the point that the Jew shall hide behind a big rock or a tree and the rock or tree shall call on the Muslim saying: hey, O Muslim there is a Jew behind me, come and kill him, except the Gharqad tree which will not say, for it is the tree of Jews.” Agreed upon. This is seemed to be very soon and close now. We ask Allah SWT not to test us so hardly if we live till this horrible moment insha’allah. Alzaree would not confirm his hiring, at one point saying he would not come to Cleveland because a reporter was inquiring about his background. Gee, what do you think a reporter might be looking into, Mr. Briggs (real quick wits among these establishment media dhimmis, eh? ), and who could possibly be motivated do such an investigation (grin)? Abou Hurairah RAA narrated that the messenger of Allah PBUH said: “By Allah it is about the time the son of Maryam comes down and he shall rule with justice and he shall break the cross and kill the pig and will remove the “Jezyah”; (i.e. the supposed tax paid to the Muslim government by non-Muslims who live with them against guarding and protecting them which is mentioned in the Holy Quran in Surat Al-Tawbah (9-29) as a “fard” or requirement in despite of being lost and no longer practiced nowadays by almost all Arab and Muslim Countries), (that means that only Islam shall be the only accepted faith and religion), and the wealth shall increase to the point the charity is not needed” Reported by Al-Bukharee and Muslim. Now remember that what initially got Alzaree’s predecessor Damra into trouble was a videotape that came to light of him raising money for Palestinian Islamic Jihad and convicted PIJ leader Sami Al-Arian (video and transcript available from the Investigative Project). Damra was also filmed urging his supporters to point “a rifle at the first and last enemy of the Islamic nation, and that is the sons of monkeys and pigs, the Jews." This is the same Fawaz Damra that was hailed as a great inter-faith leader in Cleveland. Now it seems that Alzaree has been hired to bring in Damra’s harvest of hate. Ahmed Alzaree encourages his flock by bringing to mind the glorious day in the future when stones will call out for hiding Jews to be killed and laments that the practice of jizya is no longer imposed on Jews and Christians in the Muslim world as a testament of their submission to Islamic imperialism. Real nice. 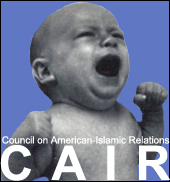 A real paragon of peace the Islamic Center of Cleveland has hired in Ahmed Alzaree. A real inter-faith leader like Damra, wouldn’t you agree? If you have any doubts, just listen to Alzaree’s recent sermon, “Prejudice from a spiritual perspective”, where he will no doubt tell you all about his peace and love for his fellow members of the Abrahamic tradition and his efforts to spread the love and engage in inter-faith dialogue at Creighton University. Just don’t hide behind any rocks in Cleveland anytime soon. UPDATE: COAT contributor Sun Tzu informs me that just prior to being expelled from the United States, one of the preachers that Ahmed Alzaree brought to Omaha was his friend and fellow Egyptian terror cleric Wagdi Ghoneim, who one US immigration official explained was kicked out of the US because “our task is not to sit around and wait for people to blow up buildings”. According to an Islamic Center of Omaha newsletter, Ghoneim visited in August 2004. JihadWatch reminds us that Switzerland has also banned Ghoneim from their country in 2005. As Daniel Pipes has noted, Ghoneim called Jews “descendants of the apes” at a 1998 CAIR event (apparently a common theme in the Damra-Alzaree-Ghoneim “inter-faith” circles). Regular COAT readers will recall my mentioning Ghoneim recently in connection with our own Hilliard Holy War Homeboy, Salah Sultan, who the LA Times reported in July has been hanging out in Bahrain with Ghoneim, where the two had a weekly TV program until it was shut down by the government because of its extremism. My Bahraini friend and journalist Mahmoud Al-Yousif has been keeping track of Ghoneim and Sultan’s antics there. But rest assured, the Columbus Dispatch still considers Sultan a moderate.